Proud of its maritime heritage, the bustling city of Bristol is surrounded by the hills of South West England. Bristol’s harbour and city centre are lined with restaurants, clubs, bars, museums and art centres, waiting to be explored, as well as some of the South West’s most iconic attractions. The largest ship in the world when launched in 1843, this impressive feat of engineering by Isambard Kingdom Brunel is a forerunner of all modern shipping. One of the best experiences on board is ‘Go Aloft’, where participants climb the rigging to the top of the ship’s masts! Tickets also include entrance to Being Brunel – a new museum dedicated to the life and legacy of Isambard Kingdom Brunel. This feat of engineering is one of Bristol’s most iconic sights. Visitors can enjoy a guided tour (3pm Sat, Sun and Bank Holidays between Easter and October) and discover the Visitor Centre in Leigh Woods, to learn more about Brunel’s masterpiece which took 33 years to complete. A Bristol Ferry trip is a great way to tour the city’s waterways, taking in sights including the majestic Avon Gorge (spanned by Clifton Suspension Bridge) and the city’s historic harbour. Bristol has developed a vibrant street art scene – it is, after all, the city where the world-renowned street artist Banksy hails from. WhereTheWall offer 2 hour Bristol Street Art Tours every Saturday and Sunday at 11am, telling the story of Bristol’s incredible creative culture and art scene from the 1980s to the present day. Dating back to 1051, where once sailors and merchants would trade good and set sail for voyages of discovery, now Bristol’s Harbourside is filled with restaurants, bars, shops and hotels. This is a perfect setting for a stroll around the water’s edge, and to watch the boats go by, or to visit some of the city’s key attractions which are situated here. With hundreds of hands-on exhibits to explore, live shows and a Planetarium, We The Curious gives visitors the chance to interact with exhibits and take part in experiments, as it seeks to remove the boundaries between science, art, people and ideas. From prehistoric times to the present day, M Shed tells the story of the city of Bristol, with amazing film, photographs, personal stories and interactive displays. Free to enter, The Bristol Museum and Art Gallery have a wide variety of collections of art, nature and history to discover. 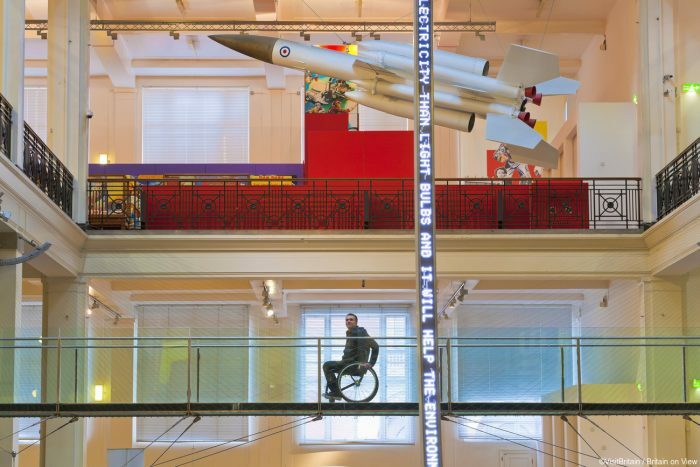 With displays ranging from dinosaurs to Ancient Egyptians to pottery and glass collections, there is a wide range of history to discover within this beautiful building. Situated just outside the city centre, Aerospace Bristol takes a look at the beginnings of the British and Colonial Aeroplane Company in 1910 all the way through to the modern day. The museum is packed full of interative exhibits, including aeroplanes, helicopters, missiles, satellites and engines – not forgetting the last Concorde ever made and flown. The following is just a selection of some of the destinations that can be easily reached from Bristol. For many of them using a Britrail Pass is an easy and cost effective way of getting around. Just 12 minutes away by train, Bath is an historic delight. The city is a mix of ancient culture and refined boutiques, beautiful historic Georgian architecture and elegant eateries, with its iconic Roman Baths still a centrepiece of the city. Just over an hour away by train, or 1 hour and 30 mins by car, this city is well known for its castle which dates back 2000 years. One of the city’s other key attractions is the Principality Stadium – home to the nation’s rugby. From its awe-inspiring cliffs to its extraordinary subterranean caves, Cheddar Gorge & Caves holds many fascinating secrets about our prehistoric ancestors, and is an international centre for caving and rock climbing. It’s about a 40 minute drive from Bath. Stonehenge, part of the UNESCO World Heritage Site of Avebury and Stonehenge is approximately 1 hour by car from the city of Bath. As the best-known prehistoric monument in Europe, and now with a fantastic exhibition and visitor centre, visitors can get up close to 250 ancient objects and marvel at how Stonehenge came to be. With its honey coloured stone, and picture postcard villages, a visit to the Cotswolds is a taste of how you would image rural England to be. Villages such as Bibury, Castle Combe and Broadway are among the pretty places to go for a stroll. Bristol is a bustling maritime city, where the historic rubs shoulders with the contemporary. But travel a little outside the city, for example to the North or the South and visitors are greeted with some of England’s finest countryside, quaint villages and a real flavour of this picturesque corner of England. Our one day itinerary gives a fascinating insight into the Roman, Georgian and Victorian influences on this charming city. A short break involves visiting a place. A microgap is about being immersed in a destination. And what better way to experience the very best food and drink experiences in Somerset, and the South West?